Since the 1960s, Dorothy Iannone (born 1933) has aimed at representing ecstatic love, "the union of gender, feeling and pleasure." Today her oeuvre, encompassing paintings, drawings, collages, videos, sculptures, objects and artist's books, is widely recognized as one of the most provocative and fruitful bodies of work in recent decades for its liberalization of female sexuality, and political and feminist issues. Created in 1969, when she was living with Swiss artist Dieter Roth, the CookBook is a perfect example of how Iannone mixes daily life, creativity and thought, culminating in her vision of cooking as an outlet for both eroticism and introspection. A real book of recipes full of visual delights, the CookBook contains densely decorated pages with patterned designs, packed text and vibrant colors. Personal sentences are interspersed among the lists of ingredients, revealing the exultations and tribulations of her life between the lines of recipes. 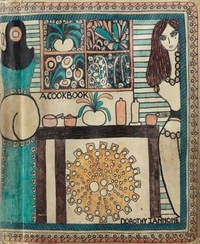 Filled with wit, wordplay and idiosyncratic thoughts--"At least one can turn pain to color" accompanies the recipe for gazpacho; "Dorothy's spirit is like this: green and yellow," is written next to the ingredients for lentil soup--the CookBook constitutes a self-portrait of the artist as a cook and a lover. This publication is a facsimile of the 1969 original, now published with a dust jacket specially designed by the artist.